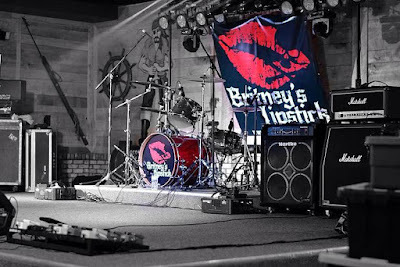 FORT THOMAS MATTERS: NKY Music Scene: Britney's Lipstick Bringing Party Rock To Merchants & Music Festival! NKY Music Scene: Britney's Lipstick Bringing Party Rock To Merchants & Music Festival! The current members of Britney’s Lipstick have been friends and family for quite some time now. They have all been members in other successful projects in the area, and came together to play the genre of music we all have grown to enjoy and love. "Most people can sing along with our set lists, and remember that 80’s and 90’s party rock era as being super memorable in the history of music. Young kids today still wear those Poison t-shirts and listen to that music! We have had a blast playing the 80’s party rock, and have really started to create a name for ourselves by doing it well." explains bass player/vocalist, Rob McCoy. McCoy coached football and baseball at Highlands from 1995 to 2004. "I can’t wait to play in front of all my friends, family, former students, and colleagues at the Fort! I have completely submerged myself in Britney’s Lipstick since I stopped coaching, and I’ve loved every minute of it. Seeing former students and players around town is fun, but seeing them while on stage at Merchants and Music will be especially cool." said McCoy. "People often ask why I stopped coaching. I usually tell them I plan on getting back into that part of my life when I get older. For now, I need to give this chapter in my life all of the energy I can while I can still pull it off." he added. Being a Fort Thomas resident for 20+ years, McCoy is excited for the city and all of the local businesses. 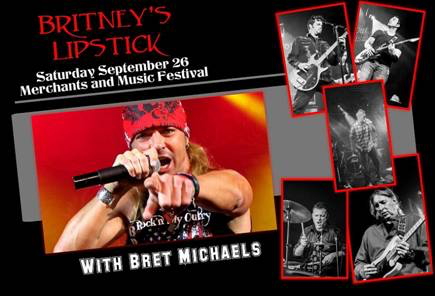 He hopes Bret Michaels and Britney’s Lipstick bring a few extra people to the Fort on the 26th and add to what is sure to be a packed fun-filled day and night of music! Britney's Lipstick has developed into one of the most popular party bands in the area. Covering bands like Def Leppard, Poison, ACDC, Mötley Crüe and other rocking bands from an era gone by, they guarantee a high energy dance party. "Playing with Bret Michaels in Fort Thomas at the Merchants and Music Festival will be especially rewarding for everyone involved, because if you are there to see Bret Michaels, you are sure to love our music as well since we were both cut from the same mold!" said McCoy. "I have had at least a hundred people around town tell me they can’t wait for the 26th….and I can hardly wait either!" The 12th annual Merchants & Music Festival is brought to you by the Fort Thomas Renaissance Board. The outdoor festival celebrates the merchants of Fort Thomas, KY and pairs them with nationally-known recording artists and fun activities for the entire family. It includes a full day of music, shopping with our local merchants and farmers market patrons and in a family-friendly environment. FREE TO THE PUBLIC. 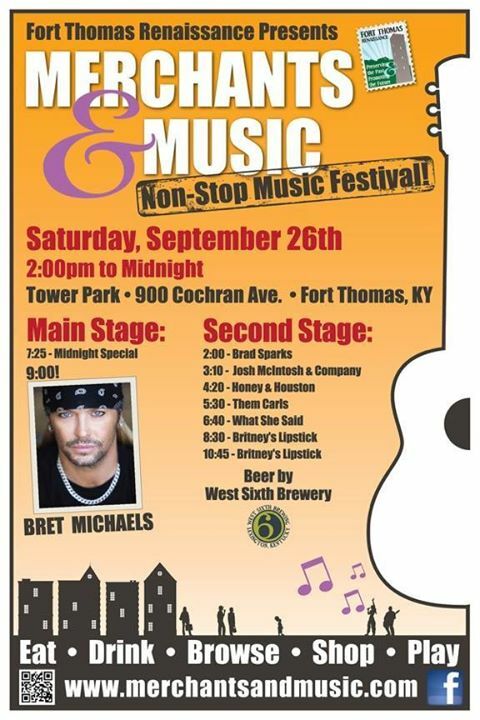 The 12th Annual Merchants & Music Festival kicks off on September 26th at Tower Park in Fort Thomas from 2PM-Midnight.